It’s the first day of Spring and I’m so excited! I love summer, but the spring season always holds a special place in my heart. Maybe it has something to do with my birthday being the first week of spring… :) I can’t wait to show you my little spring teacher appreciation gift idea that I just made. For me, spring is a season to celebrate the coming of sun and growth. Living in Seattle we have so many dreary days in the winter with little to no sun, so the celebration of spring also means the coming of sun! Who can resist a little vitamin D and flowers. Although one thing about Seattle is lots of stuff can grow here year round. I’ve got some very nice patches of moss all over my sidewalks and roof if you’re interested. Spring also brings Easter and with that many people start thinking of bunnies. So I’m sharing a fun teacher appreciation gift with you to celebrate spring, possibly a spring break, and celebrate the person who spends so much time helping your child grow. This is really a simple gift to make. I purchased the little “carrot” terracotta pots at Michaels along with the bottom plates too. Then I grabbed this cute dark wicker basket. I was going for the “dirt” look. I wanted something shorter and more like a window tray, but couldn’t locate anything like that. I boosted the height up by adding some cardboard to the bottom of the basket. Then I potted my 3 herb plants and sat them in the basket with some moss stuffed in around them. I really think they look like carrots in a garden! Then add this Somebunny supHERB spring tag, and your gift is ready to give. I would have loved to have dill in my garden, but my local store didn’t have it in yet. Dill is one of my personal favorites and I think would have looked great as a carrot stem. Chives would also probably look great. I have rosemary and two types of cilantro, which is all my store had in stock yesterday. I’d love to know, what’s your favorite herb to cook with? This really is a quick and easy gift, and one that is consumable, which many teachers love! 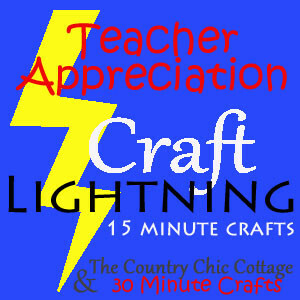 If you’re looking for more 15 minute teacher appreciation crafts, check out the other great ideas featured in the Craft Lightning series. What a great idea, I know teachers would love this over getting ANOTHER mug. Great gift for teachers….or yourself!! Love! Thanks for visiting Angela! Hope you have a great weekend too! These are really cool, and they really look like carrots! I’d be happy to get them if I were a teacher. This is an awesome idea – the teacher could take them home or use them in the classroom!